In addition to caffeine, which also influences the coffee’s flavor, coffee beans contain a few other things: Carbohydrates, acids, oils, water, minerals, trace elements and about 800 flavoring substances (approx. 0.1%). The flavors and aroma associated with coffee are not yet present in raw beans; they are only formed during roasting. This makes roasted coffee one of the most aromatic foods that exist. All coffee beans come from plants in the genus Coffea. Although there are thousands of species of plants within this genus, only two are of commercial importance: C. arabica, and C. canephora, the latter more commonly called C. robusta. Both species are tropical evergreens, are intolerant to frost, and belong to the family Rubiaceae. Arabica is genetically distinct: it has four sets of chromosomes, whereas Robusta has only two. Arabica (a-rab-i-ca) coffee represents 75% of the world coffee production. The Arabica bean yields an average of 300 pounds of beans per acre. In general, Arabica coffee grows best between 3,000 and 6,000 feet above sea level, in warm climates along the equator. The predominant producing regions are Central America, South America and Eastern Africa. In subtropical conditions, Arabica coffees thrive at lower altitudes, from as low as 1,000 feet in the Kona region of Hawaii, to about 4,000 feet in regions of Mexico and a few other locations. Closer to the equator, coffee tends to thrive at higher altitudes, from 3,500 feet up to 9,500 feet in Ecuador. The quality and taste of Arabica beans differ between varieties and growing regions--the same variety grown in different parts of the world will taste different. These taste notes can be as varied as berries (blueberry is often particularly noted in Ethiopian Harrar), earthy (a characteristic associated with Indian and Indonesian coffees,) citrus (common with Central Americans), or chocolate. The older varieties of Arabica produce the best flavor, and these somewhat fragile, older varietals require partial shade to protect the cherries from getting too much sun. Although the best tasting Arabicas are grown at high elevation, the overnight temperature cannot drop below freezing; Arabica trees cannot survive frost. Elevations between 4,000 and 6,000 feet provide cooler nighttime temperatures so the cherry's growth is slower, yielding more concentrated flavors and better acidity. Volcanic soil is rich in nutrients and provides good drainage. Robusta (row-bus-ta) coffee represents 25% of the world’s coffee production. 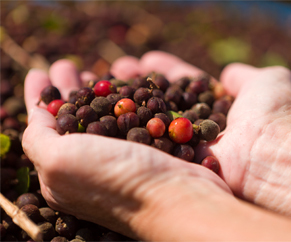 Robusta grows from sea level to 2,000 feet, in wet valley lands and humid tropical forests. The predominant producing regions are West Africa and Indonesia. Compared to Arabica, Robusta characteristics include a higher caffeine content, stronger flavor and heavier body. Robusta trees yields are double those of Arabica, and are more resistant to disease and insects. The Robusta bean yields an average of 700 pounds of beans per acre. The coffee industry uses Robusta in soluble coffee, instant coffee, and as a price stabilizer in blends. Approximately 25 million acres worldwide are devoted to cultivating coffee. The ideal growing conditions include tropical and sub-tropical temperatures of 68ºF–75ºF, abundant sunlight, rich soil, and 60–80 inches of annual rainfall. Vegetative and seedling propagation are used to produce plantings to establish new plantations or replace damaged or unproductive trees. Most plants begin in nurseries, where they are tended for 6–18 months, then are transplanted to the field, where three to five years pass before the first crop. Plant management consists of pruning, weed control, and fertilization to ensure best yields. Coffee trees are susceptible to natural destructive forces, such as climatic changes, insect infestation, and plant diseases such as coffee leaf rust and coffee berry disease (CBD).